There is a common saying that two is better than one. Most can agree that this is true. For example, two of your favorite artists collaborating on a song together might be one of the best you have heard all year. When you put four of your favorite artists together, though, something really special happens. New project, Zipper Club, starts with the ‘two is better than one’ in artists Mason James from Cerebral Ballzy and singer-songwriter, Lissy Trullie, on vocals. These two musicians together create a sound so seamlessly unique that listeners will be craving more after one song. They didn’t stop there, however, and added two more rock legends in The Smashing Pumpkins guitarist, James Iha and TV on the Radio’s Jahphet on drums and production. Every addition to this band brings with them musical knowledge only true professionals can acquire. When thinking of rock music, one might think back to the classic years of the 1960s. Since then the genre has been evolving and transforming to fit the growing musical popularity of the times. These days many have questioned if there is any true rock music being released. What happened? Have technological advances had such a big impact in the music industry that rock music has been put on dusty shelf corner? With society’s love for everything ‘new’, whether it be a new gadget, or the music that could be made with that new gadget, it is not surprising that the fear of losing classic ‘rock music’ is very much in the forefront of debates with music industry professionals and listeners alike. However, this is where Zipper Club comes in. “Going the Distance” is the band’s debut single and the answer to all the rock-music-fan’s prayers. This song combines the rock genre with a modern twist in such a masterful way that everyone can get behind. The modern twist comes from a pop synth chord that is ever-present running throughout the song: It’s an unusual timbre in the ‘rock’ music canon, and it breaks up the substantial percussion and heaviness of Zipper Club’s rock sound. Combining this aspect with Trullie’s unique vocals, Zipper Club’s sonic blend of ‘old’ and ‘new’ elements makes them charmingly accessible; their debut can sit well in the laps of many music lovers. Even though there is a contemporary turn, “Going the Distance” is still a rock song at its core. make the listener think that the author of this story is self-medicating to the point of confusion. Evoking Guns N’ Roses and countless others, the chorus line “I wake up just around two, my eternal clock is always skewed” is but another example of that living-life-my-way rock point of view strung throughout the song. 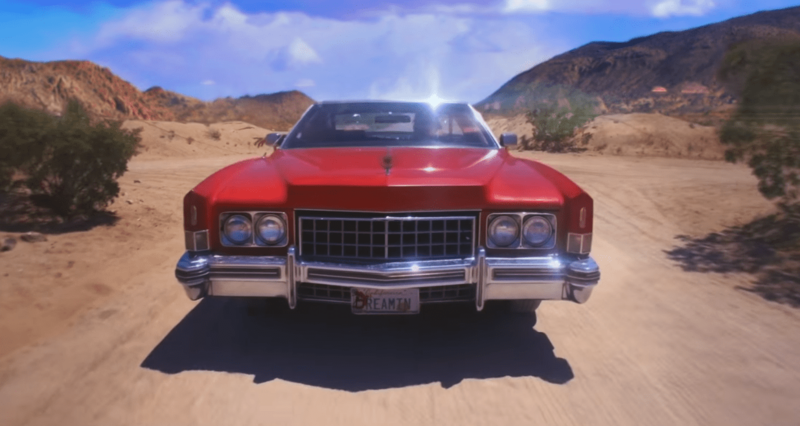 Zipper Club’s recently released music video for “Going the Distance” brings the lyrics, “I wanna find some time to be mine / let my thoughts run away in my mind,” to life. Starting off on what looks to be a road trip, the two passengers stop their car to pull two others, presumably people they kidnapped, out of their trunk. The video centers on the four characters walking through a desert and initiating the people they held captive into their group – the Zipper Club, perhaps? The theatricality of the music video evokes the spirit of the song’s lyrics: The way it is shot and what the characters are doing makes one believe that this is all taking place in someone’s imagination. The video is an elaborate recreation of where a mind can run when it is left to its own creativity. A testament to cult imagery and more, “Going the Distance” represents a metaphorical and literal initiation, introducing us to the rock canon’s next big thing. There are dozens of released albums from their previous projects between Iha, James, Jahphet and Trullie. All four bring the sounds of their past bands and music into the mix, and that experience is an immeasurable tool that can only push Zipper Club to the top of the charts with ease. Whenever musicians come together and share their unique talents with other inimitable musicians, the result is one which people cannot forget very easily. “Going the Distance” is a remarkable first single from the iconic musicians that make up Zipper Club. Their sound is set to make an impact; just sit back and enjoy this Atwood Magazine 2016 Artist to Watch.